That’s how Portland Mayor Ethan Strimling felt late Wednesday afternoon when he first learned that the American Hockey League’s Portland Pirates are severing ties with the city and relocating to Springfield, Massachusetts. 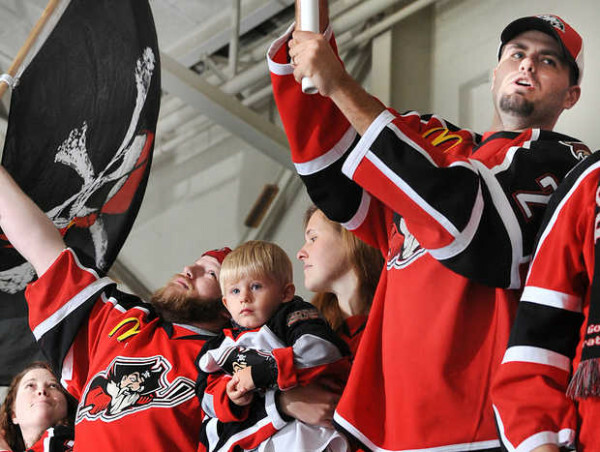 The Pirates are the top minor league affiliate of the NHL’s Florida Panthers. A story on Masslive.com reported that a group of local investors in Springfield signed a letter of intent to purchase the Pirates. Last month, it was announced that the Springfield Falcons, who are affiliated with the Arizona Coyotes, would be moving to Tucson, Arizona. Springfield was looking at being without an AHL team for the first time since the 1950s. The league offices are in Springfield. “We are currently working on a definitive agreement that would bring the team to Springfield. This contract would be subject to league approval and an agreement with the Florida Panthers, the Pirates’ parent organization,” said Frank Fitzgerald, the attorney for the investors group, in the Masslive.com story. Pro hockey actually started in Portland during the 1977-78 season when the Maine Mariners made their debut. The Mariners promptly won the league’s top prize, the Calder Cup, in their first season. They were the top minor league affiliate of the Philadelphia Flyers. Last season, the Pirates were in the first year of a multi-year affiliation with the Panthers that was supposed to run through 2018-19. The former Cumberland County Civic Center, now known as the Cross Insurance Arena, underwent a $33 million renovation spanning 2012-14. He said it will significantly affect the economy because the loss of a franchise has a ripple effect that will hurt a lot of different businesses including restaurants near the arena. “I talked to a local businessman and this will cost him thousands and thousands of dollars,” said Strimling. “Cumberland County pays almost $2 million a year in debt service, and the overage is another $800,000. The Pirates finished fourth in the Atlantic Division this season with a 41-27-6 record. They lost to the Hershey Bears in a five-game, first-round series. Portland was next-to-last in attendance this season, averaging 3,363 fans per game. The only team that had lower attendance was Springfield (3,108). The Pirates finished last in attendance in 2014-15 (2,963) despite posting a 39-28-7 record and earning a playoff berth. They played 37 home games. Since the Pirates were established in Portland in 1993, the Pirates had averaged over 4,000 per game until the last two seasons. The building, which seats 6,157 for hockey, hosted the AHL All-Star Classic twice, in 2003 and 2010. Portland played the 2013-14 season in Lewiston after the Pirates and the Cumberland County Civic Center failed to reach a lease agreement. Since 1977, the Mariners/Pirates have been affiliated with nine NHL franchises: Philadelphia, New Jersey, Boston, Washington, Chicago, Anaheim, Buffalo, Phoenix and Florida. Strimling said he is hoping they can land another AHL franchise or even one from the ECHL, which is one step below the AHL. There are 28 teams in the ECHL, formerly known as the East Coast Hockey League, but only four are in the Northeast: the Manchester (New Hampshire) Monarchs, the New York-based Adirondack Thunder and Elmira Jackals and the Reading Royals (Pennsylvania). The Pirates, established in 1993 after the relocation of the Baltimore Skipjacks, is the fourth-oldest AHL franchise operating continuously in its current market. In its 22nd season, Portland is surpassed only by Hershey (established 1938), Rochester (1956) and the Providence Bruins (1992). The Pirates won the Calder Cup in 1994 and reached the Calder Cup finals again in 1996. Portland reached the AHL’s Eastern Conference Final in 2006 and 2008. The Pirates have qualified for the Calder Cup Playoffs a total of 15 times. As of 2015, players in the NHL who are Pirates alumni include Corey Perry (Anaheim), Ryan Getzlaf (Anaheim), Chris Kunitz (Pittsburgh), Nathan Gerbe (Carolina), Tyler Ennis (Buffalo), Sergei Gonchar (Montreal), Curtis Glencross (Washington), Jhonas Enroth (Dallas), Jonas Hiller (Calgary), Chad Johnson (Buffalo) and current Florida Panther Shawn Thornton. Portland has only been without an AHL franchise for two years since 1977: 1992-93 and 2013-14. The Maine Mariners won Calder Cups in 1979 and 1984 in addition to the 1977-78 season. The Mariners relocated to Providence to become the Providence Bruins at the conclusion of the 1991-92 season.